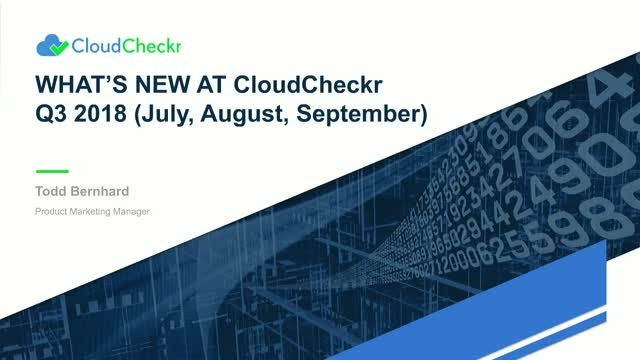 CloudCheckr is a comprehensive Cloud Management Platform (CMP) that offers a variety of features to help enterprises, resellers, and public sector organizations optimize their public cloud infrastructures. Our toolkit includes cost optimization, security, compliance, continuous monitoring, and governance features. CloudCheckr's robust offering will help your organization (MSP, enterprise, public sector, etc.) maximize your Amazon Web Services (AWS) and/or Microsoft Azure cloud usage while saving you money. CloudCheckr is updated regularly to maintain and improve the user experience. Product Expert Todd Bernhard walks you through the latest updates developed in Q3 of this year.